The power of connections is vital for collaboration. When a group of teachers come together to work together magic happens. When they come together for their students, and learning is the focus, then we have collective teacher efficacy. So what exactly does teacher efficacy mean? Hattie says it is the way you think about your role as a leader or a teacher that defines the way you work and the impact you will have. So as a teacher how do we measure our impact? When working with our school I like to make visible our school’s ethnicity data. I have been tracking ours for seven years and am amazed at how much movement I have seen in the seven years since I have been at Newmarket. We have a fabulous makeup of an amazing group of students who are predominantly Asian. Recently I have seen another surge of new migrants, when I have finalised our application for ESOL funding. I have begun with this because the makeup of our school affects our data. At the same time I stress the importance of watching the data. The aim long term is not to get caught up in the six month gains or the short term achievements that we can sometimes become excited over. I have faith that our bilingual learners will exceed our expectations when they get to secondary school because I have faith in our teachers and in my school. My first query is, ‘Do our children want to come to school?‘ So by focussing on attendance data I look at our children who have attendance gaps and determine why this happens. We have an amazing person who watches the trends carefully and catches up with families if there is a drop in attendance. We can also measure academic data and decide on the impact we expect to see. We have a range of assessment tools that give us this information and we are getting better at analysing them to target where our teaching gaps are and the effect we are having. We have a robust student management system that is able to aggregate the data and our teachers are developing in their skills to access and analyse the information. When measuring our impact I believe that understanding what a year’s progress looks like is more important than measuring where our learners sit against national standards. I also believe that it takes six to seven years to measure the learning journey to see that progress. I state this because of my training in bilingual education and am influenced by the work of Thomas and Collier who have also conducted longitudinal studies on language learners progress and have researched that it takes six to eight years to see the impact of bilingual education. We are not a bilingual school but we do celebrate the languages that our children bring with them. Every teacher needs to be tracking the children’s progress, but we really need to move faster as there is a sense of urgency for our bilingual children who are catching up. For them I expect to see greater than a years progress.We can track this by analysing reading graphs initially. When I look at reading data I love seeing something like this (Fig 1)and bearing in mind that orange to turquoise plateau when inferencing becomes even more important rather than at the text understanding. These graphs were borrowed from our student management system ‘EDGE’ and was part of what I shared with our Board of Trustees recently. Against National Standards this student is well below. Using the data I can share accelerated progress. When I look at our writing data using asTTle as one tool, I check the scores because they tell me more about student’s progress than the curriculum levels. I align them to the reading and see where everything sits. I look for something like this (Fig 2). This is a three year reading graph and writing data. Remember many of our children are migrant and often come with literacy in their first language. The reading always shifts first and the writing can lag behind. Note the highlighted number, and I am seeing less of the inflated score that can happen at the end of the year. From my own learning I see a correlation between the scores and the colour wheel. This is not yet proven, but I am seeing a trend. For example a 1B writing score shifting into the 1000s usually happens from green level in reading. As teachers we do tend to focus on reading and writing because these can be measured. 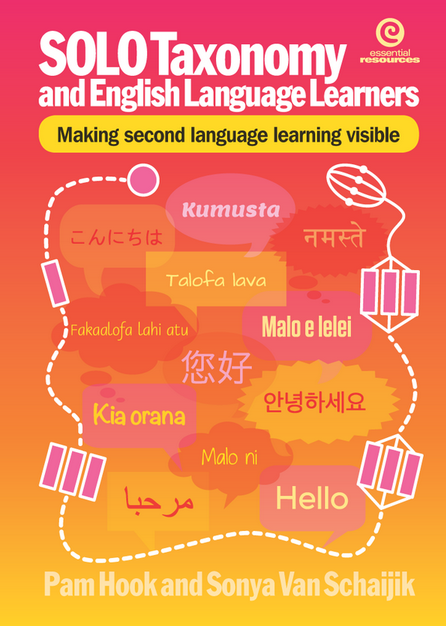 However take into account Paul Nations research into academic vocabulary and unpack what is required to achieve at this level of learning and remember how long it takes to learn a language. This can be broken down further using Academic Word List (AWL) devices by Averil Coxhead. Students need to be acquiring 2000 new words per year to make a years progress. When this is broken down further, that is approximately 40 new words per week that should be actively taught. Breaking it down further, this is 10 words per day because we take into account holidays. I recommend seriously looking at Jane Van der Zeydens book Essential Oral Language Toolkit. I love Jane’s work because it is research based and from a recent classroom teacher’s perspective. Jane also understands the sense of urgency for our English Language Learners. Recently I had a discussion with a colleague about the importance of goal setting. But not from a teacher perspective as was her understanding but from the learner’s perspective. I asked why the children were not setting their own goals looking at their own data. I shared with her John Hattie’s effect size on goal setting and suggested using the ‘Three Bear’s’ analogy also used by John. ‘Not too hard, not too soft but just right.’ The following was taken from one of our previous student projects. SOLO Taxonomy framework helped me unpack my understanding of goal setting but that is another blog post. As a school we have worked hard to have a shared understanding of data. We have looked at all our data in teams and set goals. We have shared our impact with each other and recently in teams we shared our impact with our Board of Trustees. We are gaining an understanding about the sense of urgency and about looking for a minimum impact of a years progress for a years learning. We are developing in our understanding about what the learning progression looks like at each year level as we moderate across the school. Update: https://lpf.education.govt.nz/ The Learning progression framework has just become public. Do register to increase understanding for the work we do. Well I have recently joined our Auckland Central Community of Schools as an in school teacher but with a focus on building the across school community. Those of you who follow my work will understand my excitement at this new development. I can hardly believe my enthusiasm because I have the chance to see longitudinal data being shared across our 11 schools. I have the chance to work with over 70 educators as we come together to make a difference to 7,963 children and their families. I have a chance to see if what we begin at primary school feeds through to our intermediate and then our secondary school. I can check to see how we are doing against the Thomas and Collier chart. We are all on the same journey and that is giving our best to our children. I have a chance to see and be part of a collective teacher group and the chance to see teacher efficacy in action across several schools.